Get targeted, repeat exposure from motivated landowners and buyers as they view and use county landownership information. As a 3rd-generation family owned company, Rockford Map Publishers has documented the historical transfer of land for over 70 years. In that time we have published thousands of editions in over 700 counties, making us the leading provider of plat maps and spatial data. Each year, over 350,000 visitors spend time on our website, RockfordMap.com, looking for landownership information for both commercial and personal use. Our plat books, eBooks and website provide a targeted opportunity for you to promote your goods and services to those landowners, recreationists and business owners who rely on our mapping products. With an initial 2-3 year period of premium usage, our landownership maps are unlike any other advertising and deliver unparalleled value and exposure for your company! 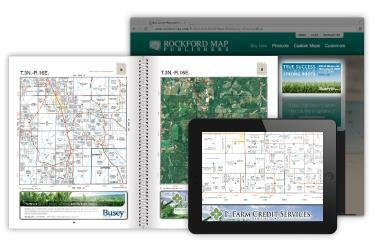 Why advertise with Rockford Map? If you want to attract new customers, grow sales, increase brand recognition, or simply want the phone ringing more, our targeted landownership map advertising can help. A county edition receives thousands of repeat impressions and only costs between $0.38 to $2 per day over a 2 year span! Preferred for our quality and accuracy. Users consistently prefer and rely on our mapping products. 100% of surveyed users said they prefer our maps over the competition. We use a combination of local resellers, landowner mailings, SEO, social media, and other marketing initiatives to maximize the exposure of your ad and deliver you the best possible return. Call today and let's put your company in front of landowners and buyers.